Well, I couldn't decide if I wanted to change my blog header for good so I made a holiday banner instead. I'll take it down in January but this looks a little more seasonally appropriate. What do you think? In other holiday decor news, Christmas is fast approaching and I just might be breaking one of my own decorating rules. What is this vow Im shattering? Its the no fake plants EVER! rule. But Im THISCLOSE to getting a fake Christmas tree. Er, I should say "faux" - yea, that sounds much better. Do I love the smell of a real tree? Yes! Do I love dragging a real tree back from my local home improvement center? NO! Do I love fitzing and futzing with it to get it straight? NO! Do I love untangling and arranging strings and strings of lights just so? NO! So it seems I have good reasons to get a 'faux' tree...but I haven't done it yet. Im having a hard time getting over the not real part. Also having a hard time finding the perfect one. So what does everyone in blogland do? Faux or real? If you have an artificial - what kind? Oh, yes, YES on the header! I love it. Every year...from when I was a kid, to my first year living alone in a tiny, TINY apartment, to the year I was out of town for biz until Christmas eve...I have hauled a big, fat live tree into my living room. And spend the remaining 364 days of the year finding pine needles in unexpected places. But there's just something about a live tree...Jumbled mess of lights and all. That said, the fauxtastic trees I've seen recently are pretty incredible. For me, it's also a storage issue. Now this year will be the first year at the shore house (still have the apt). So to tree or not to tree...that is the question for us. Whatever you decide, I know it will be the rockin'est (word?) tree on the block.  LOVE the header - and i actually think brooklyn limestone is a great name for your blog if you are still thinking of changing it. we have a faux tree and love it. actually, i've never had a real tree so i can't really compare. when i move into my own place i think i want to try a real tree but i'm not fond of the pine smell...whatever you decide i'm sure it'll look amazing! A real tree, in theory, is wonderful. The reality of a real tree - not so wonderful. Faux is the way to go. We went faux a few years ago, we got a prelit, full gorgeous tree from Target for about $200. I haven't looked back since! First let me just say that I love the festive new header! Second, I'm very compulsive about the lights on our tree. I like ALOT of lights, you Must NEVER be able to see the wires and they MUST be evenly distributed!! This combination did not make for a pretty scene in my house around the holidays. It almost ended in divorce each time! So...I bought a Martha Stewart, pre-lit tree! I LOVE It! It saved my marriage! :) You might say that I'm pro-faux! HA! Love your holiday header , so festive. I know I hate fake but the Christmas tree is my exception , well it is that or no tree at all , my husband is horribly allergic to Christmas trees. I love me pre-lit trees , so easy and fuss free . No shame in a faux Christmas tree, think of all the trees that could be saved, hey maybe it is a green option. We do real trees but when they start to get old there's a very unpleasant smell that reminds me of being a few week pregnant and makes me want to vomit violently...but seriously, my friend has a faux tree that is IN CRE DIBLE incredible! she paid like $1000 for it, but it look more real than any real tree I've ever seen. In my opinion, if it looks good who cares if it real or fake.. I am obviously pro-faux (ha, I liked that, Heather Spratt). For a couple of years, we actually had the white-light trees, you know the ones that are supposed to go OUTside because all they are is a bunch of white lights on metal "branches"). Yeah, well anyway.. I put all of our ornaments on ribbon and hung them on the branches. I looked really tacky during the daytime, but it was beautiful at night. Now we have a little faux tree and I'm really happy with it. Lights: I love the little twinkly white lights, but for around the roof it has to be the big old-fashioned colored lights. And your header is great! New header looks lovely--very festive! We also have a pre-lit tree (from Lowe's) and it's heaven not to have to wrestle with strands of lights. It sits in its own vintage-y tree urn/stand which I love. I grew up with real trees and was strongly opposed to fakes. My first year married, we lived in an apt. in Phoenix, and for safety reasons, they didn't allow real trees so we went out and bought a cheapy fake at Walmart. 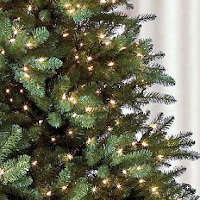 We were pleasantly surprised when we put it together to find it full and lush and very realistic looking, and it's pre-lit, so you don't have to deal with the annoying wrapping of the lights deal. I bought some very real smelling christmas tree candles from Bath and Body Works, and I make sure to always have them lit. After 4 years of doing this, I've had tons of people think my tree was real. And for only $40, I plan on doing it this way for a few more years! A couple of years ago my mom had about 4 extra faux trees in her attic she wanted to get rid of. I sent a couple off to craigslist. I saved the one she bought when I was a teenager. Guess that makes it a late 80's model. It's a blueish-green spruce and is remarkably realistic looking for its vintage. It's way too big for my place (takes up half the room), but I love the memories attached to it. Can't wait to put it up again this year! I'm grappling with the same question. I moved a carpet the other day and found pine needles from two Christmases ago. I love the smell but I hate the sap and having to worry about watering it or if it's going to die before the holidays (that happened three years ago). But ... I'm having a hard time coming to terms with a $600 tree. Admittedly, that's only about 5 years worth of trees compared to several years of buying and throwing away real trees. While I am not anti-faux Christmas tree for others, I just can't do it. I love the smell, the way it appeals to my senses, the way it looks all adorned. My main Christmas tree is not decorated perfectly - it is adorned with ornaments that appealed to me and my family at the different stages of our lives. It is not a free-for-all, but it is defintely not a prefectly decorated "Pottery Barn tree". I don't think faux trees take an eclectic style and pull it off as well. They tend to support a perfectly decorated, symmetrical scheme much better. I am sure yours will be tasteful no matter its pedigree. Although I loved the smell of a real tree, they were getting too expensive and way too messy. I have a prelit tree from Target and it's a beauty. 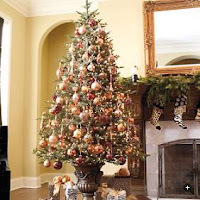 A suggestion about the pine scent, buy a real pine wreath for the house to get that "smell" of Christmas. The holiday header is a keeper. Our main tree is a faux tree & it is fabulous! 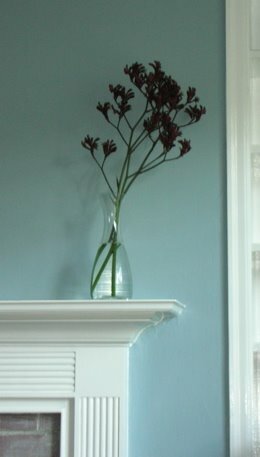 So easy to set up and take down and no pine needles tracked all over the house. 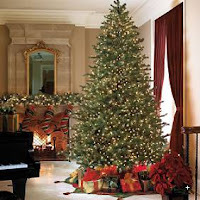 We also get a small two to three foot potted tree that we decorate for Christmas. When the holidays are over, it moves to our foyer and when spring comes, it gets planted in the backyard. It's holiday decorating & landscaping all in one! I am a firm believer in the real tree. I grew up with them (which means I am nostalgic) and David and I have started our holiday traditions with them. That being said, we hunted for a perfect tree last year and ended up spending $80 on the best available variety (whose genus and species I cannot recall). It was a near perfect tree - 7ft tall for our small room and perfectly shaped except for one tiny gap. Now that I have kids I want their memories to be as special - not the haggling part,but you get the point. Something about pulling the tree out of the attic is anti-climatic to me. Wow, I didn't realize there were so many faux'ers out there! Puts my mind at ease a little as I know you bloggers are a stylish bunch. Anyway, my husband and I make a day of going to a tree farm and cutting a fresh one. They don't shed nearly as many needles as the ones from tree lots, and they last much better. And you can't beat the smell! Fake. Faux. Whatever you want to call it -- I'm totally in. :) A live tree is just not worth the hassle to me. And I'm glad to see I'm in such good company! love real trees, but there are some good "fakes" out there and I can certainly see their appeal. grab some of those candles that smell like pine and I doubt you'll miss vaccumming needles every day. I'm in the *real tree* camp for the same reasons others have mentioned: I love the smell, I love the experience of going with our family to select our tree and have fond memories of doing this growing up, and I think a real tree looks better with a mix of lights and ornaments like we have (big lights, small lights, blinking lights, bubble lights, etc.). I think it reflects our family better than a fake tree with uniform lights. I have a fake tree that I put upstairs in front of a large window in the center of our house. I use it for my collection of crystal ornaments because I feel like the branches support them better. Love the new header! I say go for it! Faux all the way. My mom has always had really bad asthma and we could never have a real tree b/c she was always allergic. I'm a pre-lit white light faux girl all the way. I got a new one 2 years ago from K-mart, a Martha, and love it. It's tall and lush and looks so real. Everyone that comes over raves about it. You want smell you can get pine cones. I love the holiday banner! I'm on the faux, clear lights team! Find yourself a good quality tree, because I've seen some really bad impostors out there. I bought a tree on ebay in April (someone was moving). I saved a bunch and the tree actually looks nice for little money. I'm not sure if you're willing to take that risk, but Balsam Hill has pretty nice trees and will even send you a sample of the branches! Loving the new banner. I love love love that font as well. Although I do like the smell of fresh pine. I don't like finding pine needles all year long. And this will be the first year that I am getting a tree in about 2 years now and I definitely think that it will be a faux tree. Some of the faux tree look very realistic now, unlike the one that we had when I was growing up. I love your blog. I found it through Kay at apartment tbd, etc. I just can't do it. We always had real trees until I left home and my parents had an assortment of erzatz trees. We put a tree bag underneath the tree and cover it with a skirt, we have a 360 degree adjustable tree stand that locks with your foot so anyone can make it straight. We also have a very long pipe with a funnel on the end we got at the home center store. The tree stays fresh all season, because you don't have to get down on the floor to check the water. I know it's more convenient, but I just don't like things that aren't real. I don't mind if others do it, and I admire trees others have. Your banner and your home are so beautiful. I understand your dilema...We had real ones when my kids were growing up and I never missed the mess, the water, etc...The smell is just amazing and I think that you can never really replicate that or the look with an artificial one...However....for the last 4 years I have used a very good "realistic" one and don't know if I will ever go back...It is just too easy for me. love it! I teach music classes and the kids/parents don't know the difference!